L: 86" x W: 39.5" x H: 36.5"
Willowick Sofa With its tailored looks and casual comfort, the Willowick sofa makes a welcome addition to any living room setting. Part of a true slipcover collection with subtle details like gently rolled arms, waterfall skirt and piping, this piece adds a clean and comfortable look to any decor. With its tailored looks and casual comfort, the Willowick sofa makes a welcome addition to any living room setting. Part of a true slipcover collection with subtle details like gently rolled arms, waterfall skirt and piping, this piece adds a clean and comfortable look to any decor. We have owned this couch now for 6 months and are very disappointed with it. It looks nice and all but feathers keep poking out of the couch and the throw pillows. The tips of the feathers are sharp, so it hurts. We get a collection pile of feathers every day. There are feathers on the floor, stuck to the blankets, and occasionally you’ll find feathers on our clothes or in our hair. This is unacceptable especially for the price. So if you are buying a couch that will just sit there and look pretty, this one works for that. If you actually want to sit on it with your family to enjoy a movie in comfort, pass on this one. Now I honestly can’t trust that Raymour Flanigan will have anything of quality after this! Just bought couch, so can't speak to long term quality, but it is very well made, with down cushions wrapped in fiberfill to retain shape and prevent feathers from escaping. Our previous couch had cushions that were always crushed and uneven due to only feather fill. Fabric on this couch is also very sturdy, cotton twill. Couch sits higher but comfortable. Easy to get up and down from. We had a great customer service experience at Seekonk store as well. This coach is very comfortable. My family is enjoying the comfort of this coach. I have fallen asleep on it many times. I highly recommend this coach to anyone. We just bought this for our beach house in the cream color. It is absolutely beautiful. We picked it up from the store and were so impressed with how it was packaged and wrapped up. It was in perfect condition upon unwrapping it, which we were concerned about because of the light color. The quality is great. The fabric is strong yet soft and the set itself is some comfy. Great quality all around! Have only owned this sofa and swivel rocker a few days, but absolutely love them. Ordered the sofa in granite and chair in putty, they look awesome in the room and are very comfortable, looking forward to enjoying for many years. LOVE this sofa! Classic and well-made. Looks great. Love the fabric as well! The sofa and chair are very comfortable. My one concern is the skirt on the sofa and rocker are wrinkled. Probably from the packing. I thought they would smooth out a bit but they are still wrinkled. How do I make them smooth. Obliviously ironing is out of the question. Any suggestions? So far so good. 8 way hand tied. I like the material. The color blends well with our room. Was easy to set up and easy to put the legs on. So far it looks like a really good purchase. We just bought the couch but so far it has been great. Very comfy and continue to fall asleep on it! Great piece of furniture. Style and comfort! My Willowick sofa arrived on Tuesday & I love it. The delivery men were on time, in fact they came earlier which was great! I will certainly shop at your store again! Great fabric- great color/ so comfortable! Beautiful couch that is comfortable enough to sleep on and sit on for a long duration with a good book! love the slipcovers, perfect for a home with pets. My wife and I stopped into Raymour and Flanigan a couple of weeks ago as we knew they were having a one day sale. There it was! This beautiful couch and loveseat in grey and slipcovered! Just what we were looking for! We bought the set and couldn't be happier! The furniture is extremely comfortable ! Looking forward to many nights of lounging in bliss!! Best choice ever for us!! Great price. Comfortable. Beach look. We are going back for the ottoman! Awesome?? Very satisfied with our purchases. I love our new willowick sofa. Exactly what we were looking for?? The salesman was wonderful and delivery service was just as good. Highly recommend Raymour & Flanigan. This sofa is of quality comfort and looks great. Perfect for our New Shore House! 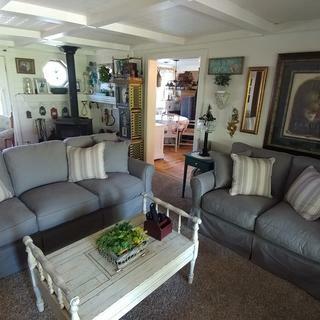 This couch fits beautifully in our shore home. The slip covers are ingenious as we can take them off and wash/dry clean them if they get stained. It is quite comfortable as well. Can i order additional slipcovers? Are the seat covers washable like a slipcover? BEST ANSWER: Please use the recommended cleaning instructions for the Willowick: Lightly brush or vacuum frequently to remove dust. Spot clean with a mild, water-free solvent or professional dry-cleaning product only. Pre-test cleaning methods on a hidden surface. A professional cleaning service is recommended for an overall soiled condition. Are there 4 or 6 legs? Hard to see with the skirt. BEST ANSWER: The Willowick Sofa has 5 legs underneath. Can I put a different cover without waterfall skirt? BEST ANSWER: Although the Willowick collection does offer special order options for different slipcovers, they all include the waterfall skirt. I have granite color. I want to change as natural color. Is it possible to change? And how much? BEST ANSWER: Our customer care team is always available and will answer any questions/concerns you may have. Please call the customer care 1.866.383.4484, option 7 for assistance. Can I order a fabric swatch for this sofa? Isnt this a slipcover? How would the cushions not be removable with a slipcover? Does this mean the back cushions are NOT washable if they are not removable? YES the back cushions are ALL removable and you can unzip the covers to wash them also. Yes they are! They are not fixed!!! Everything can be removed and washed. I saw this couch yesterday and the back cushions are removable. I need a very firm couch. I have a bad back. Is this a good choice? BEST ANSWER: I would recommended visiting your local showroom or contacting our online sales department, 866.383.4484, option 3, who can assist in finding a sofa that fits your needs. Is this a one piece sofa or separate pieces ? BEST ANSWER: This is a one piece sofa.